Demand for new HGVs falls -3.6% in Q3 2016, with 11,242 units registered. 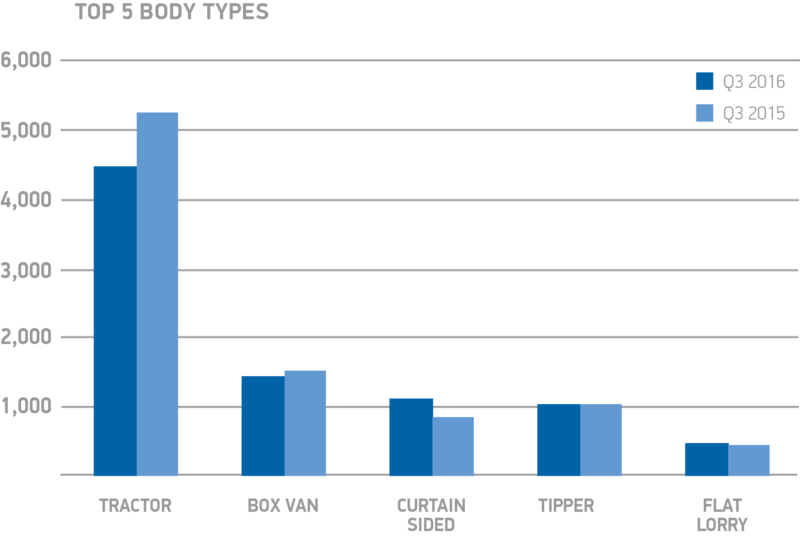 Rigid vehicles keep market buoyant, up 5.6% compared with the same quarter last year. Year-to-date market remains strong, with registrations up 6.2% â the highest since 2008. The new heavy goods vehicle (HGV) market declined -3.6% in the third quarter of 2016, according to figures released by the Society of Motor Manufacturers and Traders. The fall in demand follows five consecutive quarters of growth, and year-to-date the market remains strong, with registrations up 6.6% against the same period in 2016. Demand for rigid vehicles continued to increase in quarter three, with registrations of vehicles in the >6-16T and >16T segments recording growth, up 6.1% and 5.3% respectively. Continuing a trend set in 2016, registration of 3-axle artics fell by -17.3% following substantial growth of 38.6% in this segment the previous year. 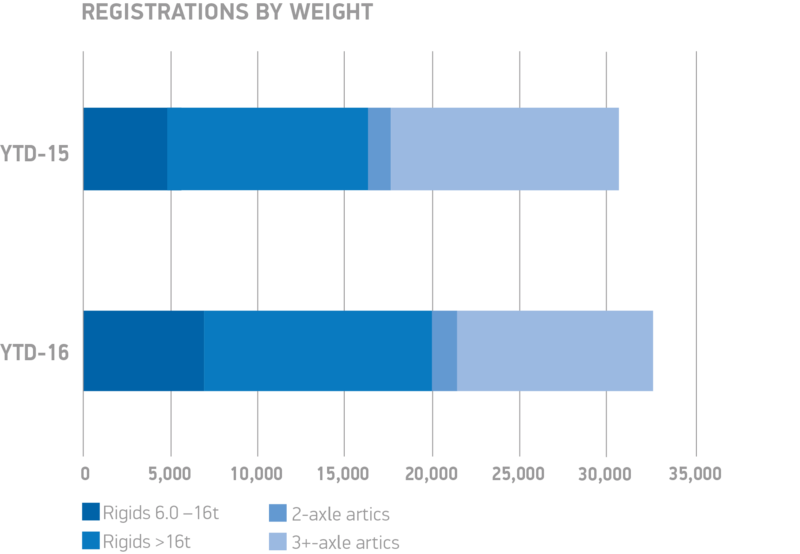 Disruption to fleet renewal patterns, triggered by regulatory changes, resulted in a significant rise in registration volumes last year. Therefore itâs no surprise to see a comparative decline in the truck market at this point in 2016. 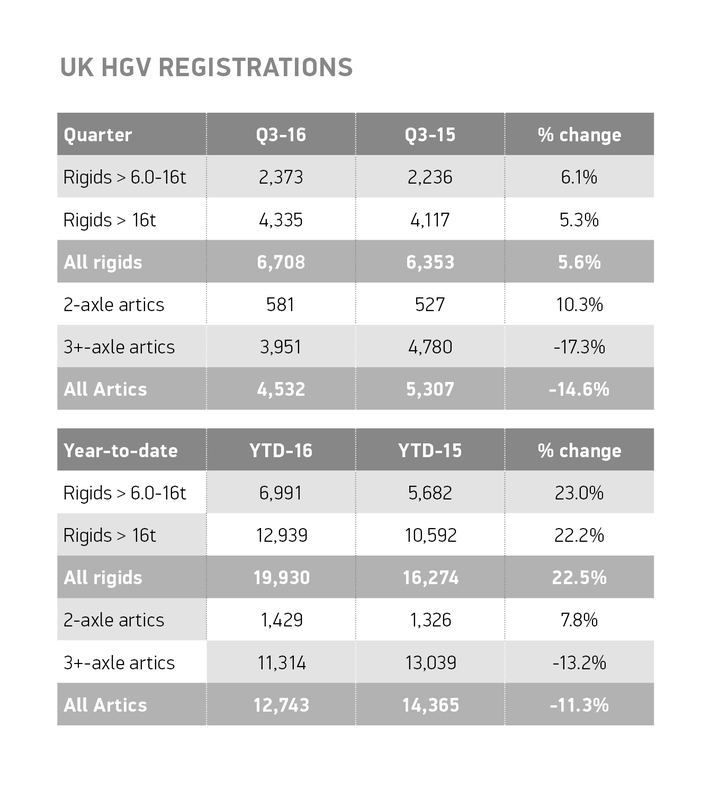 Despite the decline, the HGV market remains strong, with year-to-date registrations ahead of the same period last year, and now at the highest level in eight years. Maintaining economic certainty for operators will be key to the sectorâs ongoing success. Download the full release and data table.